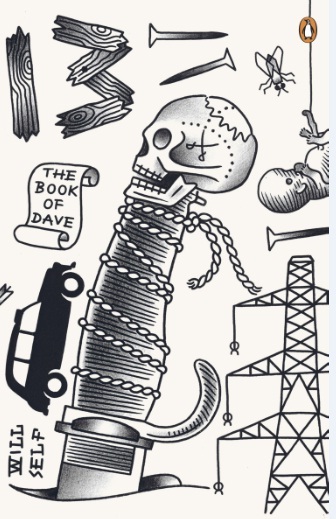 Penguin has commissioned the tattoo artist Duncan X to redesign the book cover of Will Self’s The Book of Dave as part of its limited edition Penguin Ink series. To buy a copy for £10, visit the Penguin site here. Will Self is going to be in conversation with Matthew Beaumont and others at the Howe lecture theatre, Old Royal Naval College, Greenwich, London on Sunday 13 March from 2pm to 4pm. As part of the current exhibition After London, which responds to the apocalyptic vision of London set out in Richard Jefferies’ 1885 novel, the discussion will focus on apocalyptic landscapes in literature, art and film. To reserve a place, which is free, email the gallery, slg@gre.ac.uk. More details here. There was a short feature on Will Self’s friend and colleague the “deep topographer” Nick Papadimitriou, who most recently helped with the research on Self’s The Book of Dave, that included contributions from Self, Iain Sinclair and Russell Brand on Newsnight last night. You can watch it again here – it starts around the 36-minute mark. Papadimitriou’s book Scarp is due to be published next year by Sceptre. His podcasts on Resonance FM can be downloaded here, and there’s a short clip from The London Perambulator here. The unabridged recording of The Book of Dave – all 18 hours and 15 minutes of it – that Will Self recorded last Autumn has been released by Whole Story Audio Books for £30.62. Details here. Because of “unprecedented demanded”, the British Library has rescheduled the talk between Russell Hoban and Will Self from February 2 to February 15 2011 to “a larger venue” (TBC). Hoban will be talking about his novel Riddley Walker (1980) and its extraordinary language, as well as his other work, which includes Kleinzeit (1974), Pilgermann (1983), The Medusa Frequency (1987), Amaryllis Night and Day (2001) and Angelica Lost and Found (2010). You can find Will Self’s introduction to Russell Hoban’s masterpiece, Riddley Walker, here, which has obvious parallels with Self’s The Book of Dave. Interview around the time of The Book of Dave on Radio 4’s Woman’s Hour about single dads. Brief interview with Will Self on the publication of The Book of Dave in Brazil.